Does your love feel like a fairy tale? Show it with this pretty wedding invitation printed with the romantic verse, "Once in a while in the middle of an ordinary life Love gives us a fairy tale." Your wording is printed in your choice of ink colors and lettering styles. The verse design is printed in the same ink color you choose for your wording for a custom look. This product features thermography printing. Thermography is a unique printing technique that results in raised lettering you can feel, which adds to the luxurious experience of this printed piece. Invitation includes inner and outer envelopes. I paid for the premium paper and was very disappointed. It is more like thick poster board than wedding stationary that I was expecting. The printing was wonderful and the color was spot on. If I could afford to, I'd reorder them somewhere else where I could get better paper. Delivery time was great. LOVE LOVE LOVE MY INVITATIONS!! I ordered these as my wedding invitations in navy blue ink and they are beyond perfect. Great quality and great price! I am a huge Disney fan. I wanted to bring little touches of my Disney magic to my wedding without being childish or tacky. This was the perfect way to add a little fairy tale to my wedding before our guests even get to the wedding! They were delivered very quickly and they are stunning. Everyone that has seen them so far has told us how much they love them! Chose mid-range stock that turned out to be a very nice weight; actually heavier than I thought it would be. Really liked the invitation verbiage and we chose a passage to be read during the ceremony that has the same words in it. Order was shipped when expected. Arrived right on time. All of the pieces were in boxes that kept them neat and they were not damaged in any way. These were stunning when they arrived! I opted for the shimmer card stock last min and I am so glad I did they are just beautiful everything I hoped for and more and the price was unbeatable! And they shipped so fast I didn't wait long at all to see them! My invitations turned out wonderful! You receive exactly what you see and the customer service is excellent. I ordered my save the dates through Invitations by Dawn also, so I talked to customer service A LOT! This invitation stuck out immediately as we are having a "fairy tale" themed wedding. We were engaged in Walt Disney world but did not want actual Disney invitations. They are on high quality paper. The options given when purchasing are wonderful. The color is bright and beautiful as shown. I have already recommended invitations by dawn to my bride friends! Fell in Love with this Invitation! I ordered a sample of this invitation, along with several others, but knew the moment I saw this one that it was THE invitation. I liked that the design was simple but still illustrated for my family and friends that the wedding was going to be one out of a fairy tale. I was also able to find the same design for my wedding website! Overall, great value for a great invitation! I ordered these invitations for my wedding. I thought they looked beautiful when we received a sample of them in the mail. So we went ahead and ordered the invitations, reception cards, rsvp cards and thank you cards. When we got them in the mail it was not what we expected. The ink on the invites and reception cards were a light purple color and we asked for Violet (much darker purple and what the color was in the sample) The rsvp cards and thank you cards came in the correct violet color. We called the company and customer service said they would resend the ones that had the wrong ink color. I was happy about that. Well a week later when we got them in the mail they were the WRONG color again. I called and spoke to customer service and after waiting on the phone for a very long time they said there was nothing they could do about it. Needless to say, I will never order from this company again. I am so happy with my invitations. They have great prices for every budget. I will for sure recommend them to others. I can't wait to send them out to my guests. They will love them!!! The color I picked didn't come out the way I expected, but they were able to redo them for me and no additional cost. They know how to take care of their customers and really care about them. Both times they were shipped, were really quick. They were also helpful online and over the phone and got back to me right away. Better than I ever expected. Love them and everyone gave me compliments! Absolutely lovely invitations! These embody both simplicity and elegance. Wonderful, heavy paper with beautiful Rosewood Ink. 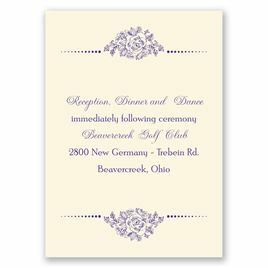 It was a breeze creating my invitations and I was so happy to see the possibility for such customization in colors, fonts, etc. in a organized and simple way. Customer service was readily accessible and always very helpful. My invitations were packaged beautifully upon arrival and looked better than anticipated. I am very happy with my order and my experience with Invitations by Dawn! I love the invitation, but was very disappointed in the quality. All of the response cards were printed off center. Some of my invitations had the tops cut off of them. Luckily I ordered extra, so I had to make do. My invites need to go out this week and I don't have time to have them reprinted. After stuffing and sealing most of the invites I realized one of them had a smudge image on the back. Like the ink from the card on bottom didn't dry in time. I wasn't looking at the back of them and I only hope there wasn't any more with that problem. I'm calling the company tomorrow to complain! Loved it! Great shipping time! Absolutely gorgeous!!! So glad I chose invitations by dawn! These invitations were gorgeous and arrived very quick! Looked better than those that cost $500. Pretty, good quality and easy. Received in 1 week. Absolutely beautiful. Very fast shipment and arrival!! Looks even better than I hoped for! It was very nicely done. But my daughter misspelled the word reception and that is how it got sent to me with the misspelled word. I was very surprised that it would pass so many people before it got delivered to us and did not get cuaght. I still get butterflies when I look at the invites! We ordered early because I don't want to be that bride that waits and has nothing but horror stories to tell. I can't wait to send these out!!!!! Delivery was beyond prompt, and the attention to detail in the packaging (we ordered thank yous, RSVP cards, and invites) was so helpful! The Fairytale Invitations were perfect. We are using this product for our wedding invitations. The people we have shown so far are "wow-ed" by how beautiful they are even though they are a simple design. The words are very clearly read and the color is beautiful and matches our them perfectly. The only thing I don't like is how there is a fee for a prettier envelope. I think all wedding invitation envelopes should come with the beautiful lining. Invitations prettier than shown on site. Received many compliments. The invitations are beautiful and the customer service is the best I've seen yet. I highly recommend this site... and keep an eye out for great sales!!! ordered my wedding invitations and they came out beautiful!! the price was great and i was so excited when i got them! !